Life in the jungle is always an adventure! Here at the Tailwind Jungle Lodge we host a variety of wonderfully unique guests. People from all over the world join us in celebrating the beauty and magic of this natural place. This week we had some particularly special guests in the jungle . Professional aerialist, Sabrina Pringle, and her stuntman husband, Jonah Logan, have opened our eyes to the art of swinging from the trees. Together, we wandered around our jungle trails looking for just the right tree. Lucky for me, we decided upon my personal favorite tree on our property, a spectacular palm tree in the elaborate embrace of a well-established strangler fig. Before I knew it, Jonah (also a rock climbing instructor) had his climbing gear out and was making his way up the tree. Shortly thereafter, a stunning length of blue silk was hung from the tree and Sabrina gave us a magical aerials performance. The jungle has never seen anything quite like this before! Some of you may be familiar with silks from our local community center, EntreAmigos, where they have several silks hanging from the ceiling and have put on several performances in the past. 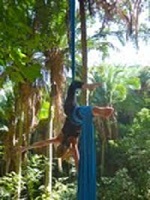 Aerials on silks is a beautiful art and extremely challenging too! Sabrina was kind enough to give to give me a quick lesson. As I learned some basic moves, including the “climb”, “brake” and “hip tilt”, my adrenaline was pumping. Very exciting to learn something new! I will also say that my arms were definitely feeling it the following day. The strength involved in dance with silk is tremendous. Watching the grace and fluidity of a performer like Sabrina is very misleading; she makes it look easy! Want to see more swinging from jungle trees? Check out these short videos, Aerials and SUP in the jungle. We’re also excited that Sabrina and Jonah are planning to host aerials/yoga retreats at the Tailwind Jungle Lodge in the near future. Interested in swinging from the trees? Stay tuned . . . this might be your chance! Ready to get your health back on track? Check out my free guide to start listening to your body.